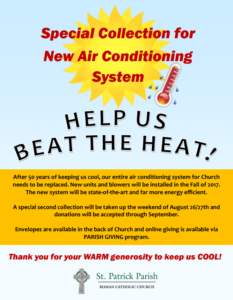 Back in June (2017), we received the sobering news that our Church Air Conditioning System was on the “fritz.” One of the four units outside had died and the other three which are 25+ years old have problems. The air handlers which pump the air into the Church and are located in the Choir Loft are 50 years old and they too are not working up to speed. The recommendation we received in June was to pray–pray that they make it through summer. Well, our prayers are working as our AC System is still alive now in August. But the system is still in need of repair, especially now as it runs overtime making up for the downed unit. The recommendation now for the off season is to replace the entire system. Over the past six weeks, together with our Facilities Committee and Parish Councils, we’ve learned what that might look like, what that might involve and what that might cost. Suffice it to say, this will be a major capital project. We are looking at a 2 month job and a 6 figure cost. The Good News is that summer is almost over, so time is on our side to pursue the best coarse of action. And that’s what we are doing. I don’t want to begin next summer (2018) with our fingers crossed. We need a new system. To that end, before summer is over, while we are still warm under the collar and appreciative of cool air, we will have a special collection to help this cause. 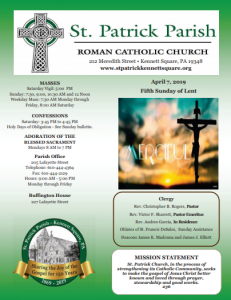 Flyers and envelopes are in every bulletin this weekend (8/13/17) and a special collection will be taken up 2 weeks from now, August 26/27, 2017. Because of our fine facilities team, staff and entire parish community, I am confident that we are can address this need and get a state of the art, energy efficient system in place by next summer. But every financial gift counts and is certainly appreciated. So I will keep you posted. In the meantime, keep your prayers coming. Summer’s not over yet!